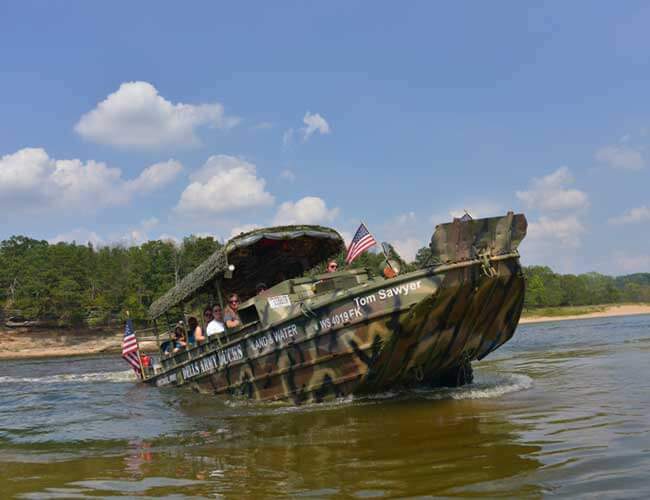 For over 70 years amphibious DUCKS have been the most unique means of touring Wisconsin Dells’ famous rock formations. The DUCKS got their start from a Milwaukee man named Melvin H. Flath. Prior to starting the Duck tour in Wisconsin Dells, Melvin owned a trucking business on 2nd St. in Milwaukee. 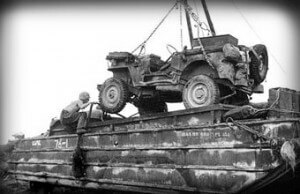 Right after WWII, Melvin read about some surplus trucks for auction in California. He wanted one, so he journeyed the 2,000 miles at great financial risk to buy some needed trucks for his business. Upon arriving in California, Melvin saw that the trucks being auctioned were the amphibious trucks (DUCKS) and not anything he had envisioned. His disappointment turned to adventure and against all common sense he bought a DUCK. 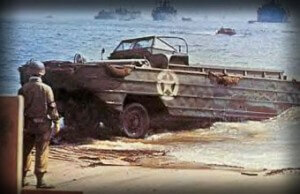 Two weeks later, Melvin drove the first olive drab half truck/half boat into his Milwaukee neighborhood. The neighbors as well as Melvin’s pregnant wife and three children came out to greet him. He was received, but not with open arms. Everyone made fun of Melvin for wasting good money on a hunk of junk that he could use for what? Melvin didn’t know at that time what he was going to use his DUCK for. Despite the adversities, he carried on and bought some used Milwaukee bus seats which he installed in the DUCK. He took his buddies with him on it’s maiden voyage out into Lake Michigan. Melvin had never owned a boat before and wasn’t aware it had plugs, so his first splish-splash was almost his last. He made it to shore and quickly learned that this was no ordinary 2 1/2 ton truck. 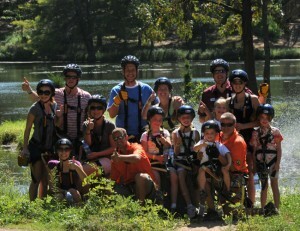 On Sundays, Melvin took his family with him on the DUCK to Pewaukee Lake. There he charged 50 cents a person to ride his DUCK from land to water. 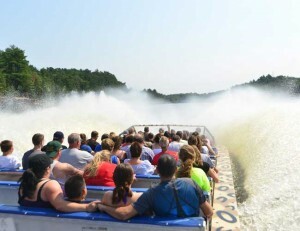 All the people screamed with excitement every time the DUCK hit the water! Someone told Melvin he had a great idea and why not take his DUCK to Wisconsin Dells where everyday is a Sunday. The following week he did just that. 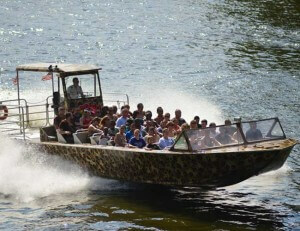 That first Wisconsin Dells Duck tour began in 1946 and lasted one and a half hours. The first tour does not exist anymore. 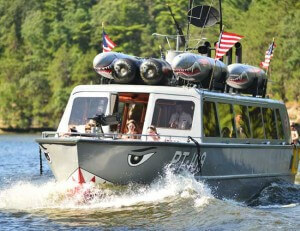 Today there are two DUCK companies with similar tours operating in Wisconsin Dells. 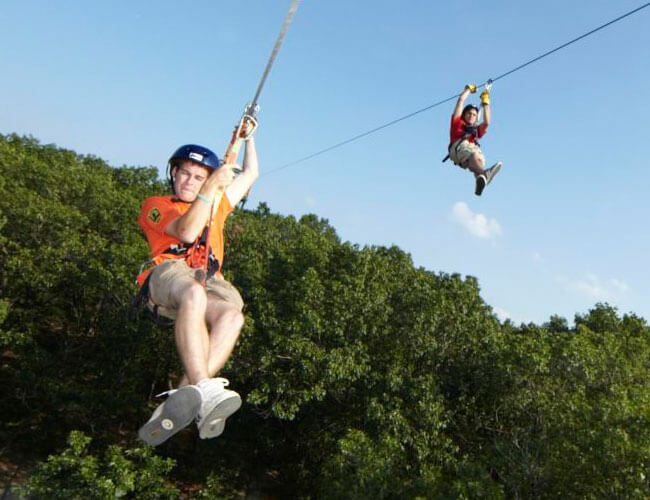 Other areas with Duck tours include Branson, Missouri and Hot Springs, Arkansas. 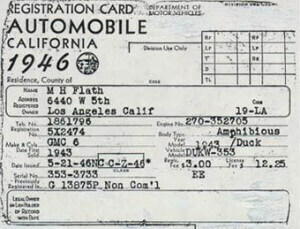 Registration and title of the first duck purchased by Melvin H. Flath in 1946 at an Army Surplus auction in California. A strict requirement for such a purchase was that one had to be a resident of California. Melvin was a resident of Wisconsin, so he made up an address so he could buy his first duck! !